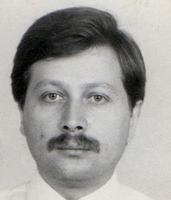 Не graduated from Architectural institute in 1977. Ap to 1982 he worked in his profession and taught part time in Engineering academy. The first cartoon appeared inpres in 1985. From that time has won over 20 prizes in international competitions in the different countries. Personal exhibitions in 6 countries abroad have been also held. Works as an art chief at the enterprise of applied art. Member of Artists Union of Russia.